As with most folks, I have heard that lowering your car would improve its cornering ability. I have read a number of books on suspension theory. The general idea is that with a lower center of gravity, there will be less weight transfer to the outside tires. I have also heard that negative camber on the tires is a good thing. But I was worried that as I lowered the car, the camber might be affected in a bad way. When I looked at the front control arms with the stock springs and the car with all its weight on the wheels, I could see that the control arms were basically level. The simplest way to lower the car is by using shorter front springs. This has the effect of lowering the spring perches or shock towers, which basically lowers everything else at the front end. The rear is a little different in that the height of the body is set by the torsion bars. The torsion bars can be pulled and “re-indexed” to set the body higher or lower as required. Do both the front spring and the rear torsion bars together and you can lower both ends of the car. So I decided to do a little experiment. Looking at the following picture, I put the car up on the lift and simply propped the front suspension up with a stick on a bottle jack. I started with the front suspension in full droop. As I pumped up the bottle jack, I could move the suspension through its range of motion. Oh, for this experiment, the coil spring was removed from the McPherson strut. 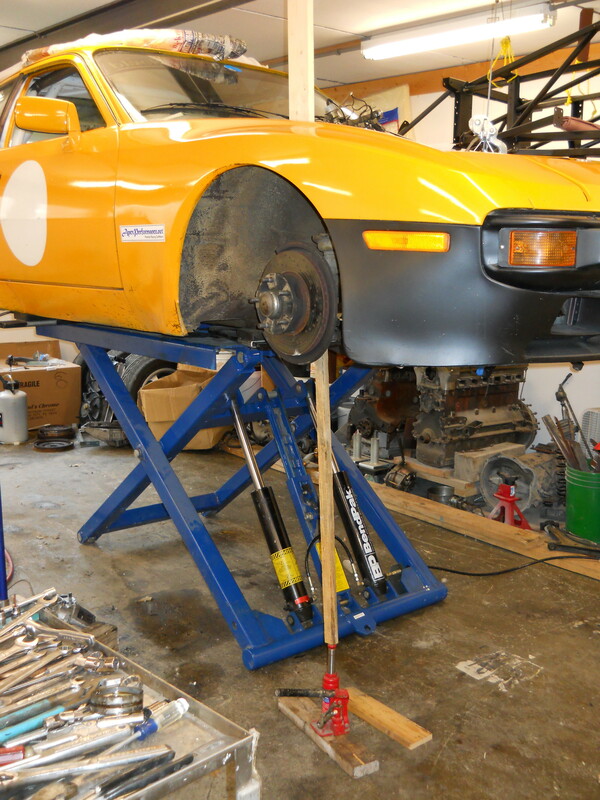 While I moved the suspension upward, I had my digital level attached to the face of the brake disc, effectively reading the camber of the mounting surface for the tire/wheel assembly. Looking at the raw data, it was really interesting. With the A-arm level defined as zero degrees, the suspension travel of from -13 degrees of droop to +14.5 degrees of compression. As you would expect, the camber was way off at -13 degrees of droop. About 2 degrees positive. At -4 degrees of droop things are getting better but the camber is still about 1/2 degree positive. Note that with these numbers, I am assigning zero degrees of camber to the point where the A-arm is level. As the suspension goes into compression is where things get interesting. The camber change for the first 4 degrees of suspension compression is only 0.2 degrees! The camber change for the first 8 degrees of suspension compression is only 0.5 degrees. Full compression only adds another 0.1 degree for a total camber change from a level A-arm to full compression of only 0.6 degrees! I find this to be rather remarkable. I am sure this is a known capability of the suspension geometry that Porsche has used but I have never seen it discussed before. What it means is that as the outside front tire in hard cornering goes into compression, the change in camber of your tire/wheel assembly is hardly affected by the suspension. What this also means is that when I lower the car (in effect causing the A-arm to slope, adding suspension compression) there is little adverse affect on the camber. I like that fact a lot! Not to leave out the rear, the trailing arm type suspension used at the rear is already in good shape, as it inherently does not introduce any camber as the suspension compresses. As a consequence of this finding, I feel better about moving ahead to lower the car, which I will discuss in a future article.